This article concerns the singing of the Ordinary Form of the Mass, but its main point pertains also to the desirability of sung Masses in the Extraordinary Form. In other words, the chanted celebration of Mass should be a rule, not an exception. The same document, which is still the most authoritative Vatican document on music since the time of the Council, states: “For the celebration of the Eucharist with the people, especially on Sundays and feast days, a form of sung Mass (Missa in cantu) is to be preferred as much as possible, even several times on the same day” (MS 27). As if to underline that singing is not an add-on but part of the inherent structure of the Mass, the Instruction Musicam Sacram goes on to establish, perhaps surprisingly, three degrees of musical participation for Mass (see nn. 28-31), such that one should begin by singing what pertains to the first degree, then add that which pertains to the second, and finally, move on to the third, according to the capabilities of the congregation and choir. The first degree includes the entrance rite (including the Collect), the Gospel acclamation, the oratio super oblata, the preface dialogue and preface, the Sanctus, the doxology of the Canon, the Lord’s Prayer with its introduction and embolism, the Pax, the Post-Communion, and the dismissal. The second degree adds the Kyrie, Gloria, Creed, Agnus Dei, and the Prayer of the Faithful. The third degree adds the Introit, Offertory, and Communion antiphons, the Gradual, Alleluia, or Tract (if chanted in full), and the Epistle and Gospel. One can see that the first degree depends on the priest’s chanting his parts given in the Missal, which, in the Church’s tradition, have always been in a simple form of chant, involving a few notes of melody, and may even be sung recto tono in a case of necessity. 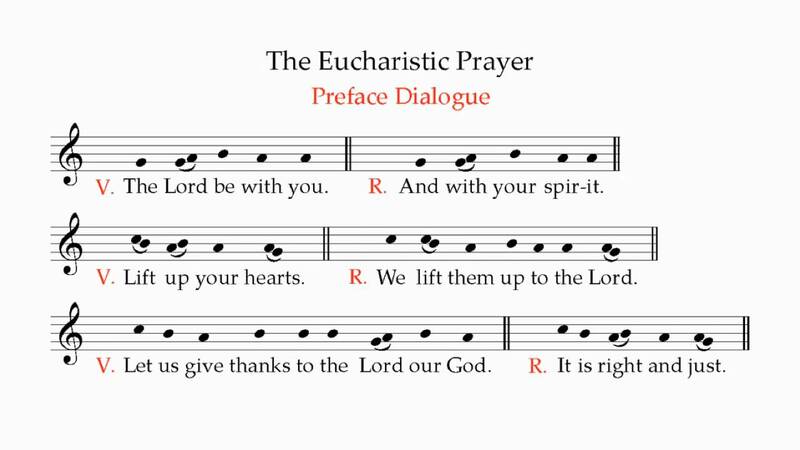 These prayers and dialogues are the most fundamental elements of the liturgy to be chanted. The second degree adds beauty and solemnity by giving the choir and faithful more scope for singing the Ordinary of the Mass, which brings out the full richness of the prayers themselves. The third degree completes the musical elevation of the liturgy by ensuring that its meditative texts (antiphons and lessons) are sung. It is too obvious to be denied that a celebration sung in the Gregorian manner is more solemn than a celebration which is merely recited; but this statement is especially true in the modern perspective of a celebration which is habitually recited. The ancients had provided melodies for the most modest celebrations of the liturgical year, and these melodies were no less carefully worked out than those of the great feasts. For them the chant was, before all else, a means of giving to liturgical prayer a fullness of religious and contemplative value, whatever might be the solemnity of the day. Such should also be our sole preoccupation in singing. As long as people look upon the Gregorian chant solely as a means of solemnising the celebration, there will be the danger of making it deviate from its true path, which is more interior. 41. 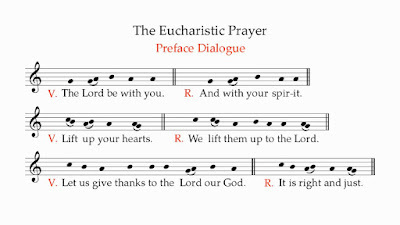 The main place should be given, all things being equal, to Gregorian chant, as being proper to the Roman Liturgy. Other kinds of sacred music, in particular polyphony, are in no way excluded, provided that they correspond to the spirit of the liturgical action and that they foster the participation of all the faithful. Since the faithful from different countries come together ever more frequently, it is desirable that they know how to sing together at least some parts of the Ordinary of the Mass in Latin, especially the Profession of Faith and the Lord’s Prayer, according to the simpler settings. 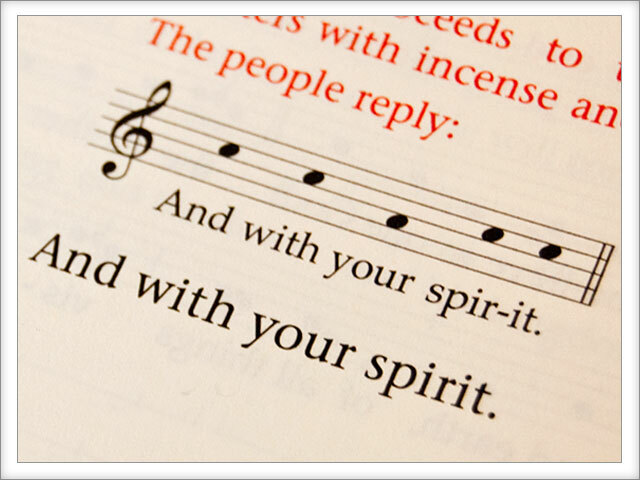 It is noteworthy that numerous magisterial documents, following the directive of Vatican II, specify that the people should be able to chant in Latin the parts of the Mass that pertain to them. We have always joyfully implemented that policy at Wyoming Catholic College. This has included the chanting of the Creed, as is provided for by GIRM 55, 68, and 137.
the celebrant introduces the Prayer of the Faithful, which is sung by a cantor, with the people making the response. With a celebrant and congregation who know their chants from repeated experience, and provided there is a brief homily as recommended by the Church for daily Mass, it is possible to do most of these things within a 35-minute daily Mass, and all of them within an hour or a little more on Sundays and Holy Days. Moreover, there is no question that the congregation participates more fully when singing their parts than when merely reciting the spoken text. From the vantage of the pew-sitter, it is the difference between the uplifting unison of simple chant and a scattered muttering of words. In conclusion: chanting the Mass is more in accord with Catholic tradition. It is in harmony with what anthropology, sociology, and psychology tell us about how ritual activity is best done if it is to be satisfying, renewing, and connecting. It is more in keeping with Vatican II and subsequent magisterial teaching. Lastly, it is crucial for the evangelization of modern and post-modern man through “the way of beauty.” This is the step we must take if we wish to get past the doldrums of excessive verbosity to the heights of prayerful engagement with the sacred mysteries. The GIRM cites here Musicam Sacram, nn. 7 and 16 — clear proof, if any were needed, that the 1967 Instruction is still considered to be pertinent to the Pauline missal, which appeared a couple of years later.